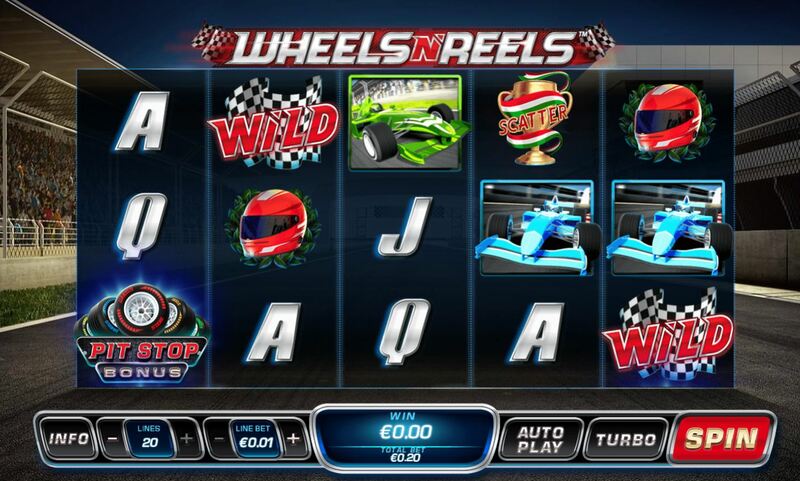 Wheels N Reels slot is pretty basic but as the name suggests, can be quite exciting seeing as it's based on the high octane theme of Formula 1 motor racing. Nothing new there when we take into account some older classics such as Monster Wheels and Racing for Pinks, although Netent's Drive Multiplier Mayhem seems to have become the go-to car themed game lately. Here the reels are transparent and spin over the home straight of a race track accompanied by some frantic music to complete the mood, so will it be the pits or the podium here for our bankroll? We have 20 fixed pay lines on our Wheels N Reels slot with all the symbols appearing singly. Our best pay in the Chequered Flag Wild which doesn't multiply but does pay a wheel-spinning 500x stake for a 5-of-a-kind! Thereafter we have the Red Car at 50x, Green at 25x, Blue at 20x and the Crash Helmet at 12x. The rest are card values of which there are four from Ace though to Jack paying 12.5x down to 4x. Now we really want a decent feature here so there are Trophy scatters on all 5 reels and they award nothing but cash prizes. Sorry, that was a bit of a false start because you have a Pit Stop scatter appearing on reels 1 and 5, of which we need to land both to trigger an attractive feature. You have a car in the pit lane with tyres laid out around it. Take two picks and you'll be rewarded with 5 to 20 free games and then a 2 to 10x multiplier. these can be retriggered and if so, you'll retain the same multiplier but simply make one pick for the number of extra free games to be added. It's possible therefore to have a 10x multiplier and land the 5 Wilds which would yield 5000x bet in this bonus. 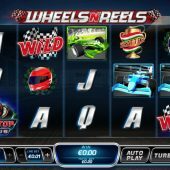 Wheels N Reels slot is a simple game, with basic graphics and animations yet is quite entertaining to play, with some serious potential in the free games which incidentally are quite volatile and not that easy to trigger. The RTP is quite high at 97.06%, with a base game that does seem to maintain your balance long enough for at least a few circuits of this fast track. Motor racing is a dangerous sport, but I'll still be back one day to spin the reels here..